Continuing on from yesterday’s post on the British Airways Terminal 5 site, today’s site of the day is “Changing The Way You Fly”, developed for Air New Zealand. 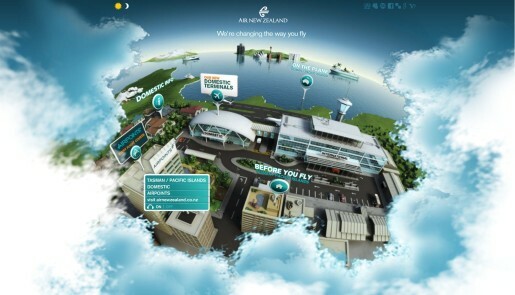 The site introduces passengers to new advances in the way flights are handled, ranging from self check in, scanners that allow passengers for self boarding at the gate, through to USB and iPod connections on Tasman/Pacific flights. The site includes social networking/bookmarking links for Digg, MySpace, Stumbleupon, Facebook, Delicio.us, Google and Yahoo. Sensibly, Air New Zealand have made the content available in both Flash and HTML formats.